Friday 5 pm to 9 pm. Saturday 11 am to 5 pm. Rich and Betsy Hill moved "to the country" in the spring of 1997, after spending over a year negotiating to buy the old Stoll dairy farm in Parkman, Ohio. With both children either in or entering college, there was no longer anything holding them in high tax country. Truth be told, there was never any thought of vineyards or winemaking in the earliest days. But the long sloping hill, with excellent air drainage to avoid spring frosts, seemed to call for grapevines to be planted. 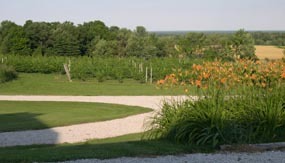 Laleure Vineyards was established in the spring of 1997 with the first planting of vines in what is now known as Betsy-west vineyard. Rich dug the first 250 holes, 12 inches wide by 16 inches deep, all by hand in tough spring-wet Geauga clay. Needless to say, a great deal of automation has occurred since that time. Without knowing the nature of the local micro-climate, four varietals with a wide range of winter and spring resistance were planted as an experiment. Included were Vignoles, Bianca, Chardonnay, and Pinot Noir. Today these same vines produce crops of consistent high quality grapes. 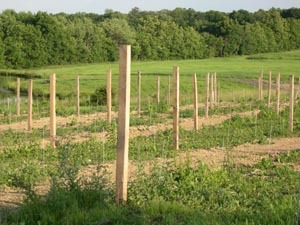 Later expansion to the Jeanne-east vineyard added Riesling to the list of varietals. The most recent expansion was in the Amy-south vineyard where we have planted cabernet franc and chambourcin in the spring of 2004. After the first vines matured, and it was confirmed that indeed you can grow grapes in Parkman, the idea of becoming an Ohio winery began to take hold. The thought of converting the old dairy farm to a self-contained vineyard and winery looked reasonably practical. 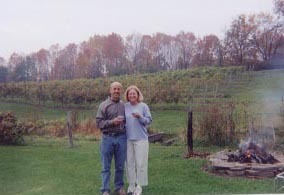 By the summer of 2002 all the permits were issued, and Laleure Vineyards was officially established as an Ohio winery. Tanks, pumps, crusher, presses, bottler, filters, and other equipment had been purchased, and a fairly complete chemical analysis laboratory was established. The 2002 crop became the basis for the winery's first offerings. The winery opened for business in November of 2003 with the old farm milk-house converted into a tasting room. This quaint old structure with its warm fireplace is in perfect harmony with the cozy atmosphere of this boutique winery. 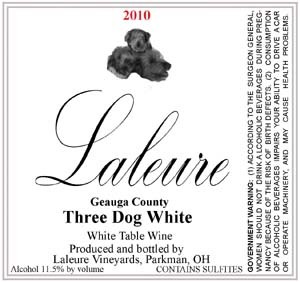 Today you can taste the Cabernet franc, Chardonnay, Pinot noir, Vignoles, Riesling wines as well as our Three Dog Red and Three Dog White blends which were all produced from grapes grown on this Geauga County farm. In 1997 the Hill's purchased the old Stoll farm in Parkman, Ohio. Rich (Dr. Hill) concentrated on gaining experience with growing grapes and making wine. Informational support from the Ohio Wine Growers Association and the state of Ohio's winter short courses and the helpful staff of the OSU agricultural school and grape extension were instrumental in providing the basics of grape-growing and winemaking knowledge, along with reading, reading, and more reading. The first harvest was small but promising in 1999. By 2001, with confidence in the newly learned skills, the decision was made to begin the process of becoming an official winery. The first official vintage was 2002, and included chardonnay, vignoles, pinot noir, Bianca, Riesling, and Seyval. Betsy's business skills were put to use in establishing solid business practices, and her talents for assembling successful retail enterprises were put to use in establishing the tasting room store. This facility, which is primarily a place for tasting and purchasing the wines made by the winery also includes a supply of wine related items for sale. We all lost Betsy quite suddenly on May 31, 2016. She was an incredibly kind, gentle person with a gift for making all who met her completely welcomed and at ease. Her ideas, gift for arrangement, talent with flowers and gardening, and hard work have made Laleure such a warm, welcoming, and friendly place. She was always working behind the scene in a very unassuming but very instrumental way. Most of all she will be so sorely missed by her husband, Rich. You can read more about Betsy in the following link. The name Laleure Vineyards was taken from Rich's grandmother Jeanne Marie Laleure Hill. Laleure is the maiden name of this native of Jouet les Tours, located in France's Loire Valley. Her father was one of 13 boys from Dijon, the heart of the great Burgundy wine region of France. Maybe winemaking is just in the Laleure bloodlines! "Great Grandma" Hill introduced Rich and Betsy to the habit of drinking wine with dinner on a daily basis during the time she lived with them in the mid 1990's. Since then, hardly a day goes by when that habit isn't practiced. If she were alive today, we are sure she'd be proud to taste the French style wines of Laleure Vineyards. Great Grandma had a favorite expression for the sometimes difficult times of her 98 year long life. When the going got tough, she just said, "Oh well, you've just got to keep it up." This attitude, along with another favorite expression, "Thanks a million" tell you the kind of person she was.